Global equity markets are testing levels potentially critical to the survival of the bull market. As this stock market correction progresses, it is natural to consider what levels may be effective in halting the decline. We have recently taken a stab at a couple potential “support” levels in the U.S. market with excellent success, so far. Those posts include Monday’s The Mother Of All Support Levels on the broad Value Line Geometric Composite which held precisely, as well as a few Premium Posts at The Lyons Share covering key sectors, which also held on cue: Market Leaders At Must-Hold Levels and Finally Some Support To Bank On (if you’d like to see these posts, shoot us an email at info@jlfmi.com and we’d be happy to share). Today, we look at an international stock barometer with an equally as compelling level. The MSCI EAFE Index is a broad index of developed markets outside of the U.S. It was the subject of the Chart Of The Day and headliner in this week’s #TrendlineWednesday feature on Twitter. In the feature, we highlight some of the most important chart trendlines currently relevant in the financial markets. In the case of the EAFE, it is interesting because it is testing the potential support of 2 key trendlines, one up and one down. Specifically, they are the Up trendline (on a log chart) stemming from the 2009 low and the broken Down trendline stemming from the 2007 top. The 2 lines are currently intersecting near the 1780 level. Each of these trendlines are important in their own right. The Up trendline contains the entire action of the post-2009 bull market while the break of the Down trendline led to the 2017-2018 rally and an eventual higher high. The fact that they are presently crossing paths makes this a particularly important juncture for the index and international stocks (the recent correction low was 1778, FYI). 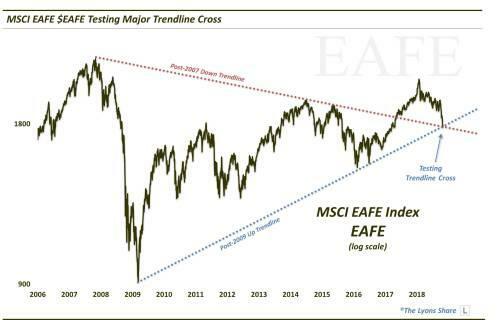 A rally from here (which may be underway as the EAFE bounced all the way up to 1815 yesterday) would maintain the integrity of the post-2009 bull market and preserve the technical progress made when the Down trendline was broken. However, a loss of this level would undermine the stability of the bull market and forfeit the key technical ground gained in overtaking the Down trendline. Will the trendline cross hold? It remains to be seen. However, it does appear to represent a significant crossroad at which the international equity market finds itself.